The 2018 LIMA awards took place in November and honored many of the stars and starlets that have been making waves in the Loveworld music industry. Yet it was a certain gospel singer that seemed to emerge from the overwhelming amount of dazzling talent. Carissa Sharon Oyakhilome, also known as CSO certainly proved to be a force to be reckoned with. Carissa Sharon Oyakhilome breaths the spirit of Christ. As the daughter of Pastor Chris Oyakhilome, the 26-year-old starlet was born into the Loveworld empire. Practically from birth the singing starlet has learned about the importance of spreading the gospel. Her father, known to his ‘Loveworld citizens’ as the man of God has dedicated his entire life to teaching the Word of God. Pastor Chris Oyahkhilome’s Christ Embassy is a multi-faceted global church with divisions in music and entertainment, youth, education, healing and more, all unified in the aim of empowering people with teachings of Christ. This sort of atmosphere has certainly had an impact on Sharon Carissa Oyakhilome, who took her father’s teachings and turned it into award-winning music. Her song ‘Holy Spirit’ is a smash hit and has won her multiple Loveworld International Music Awards (LIMA). 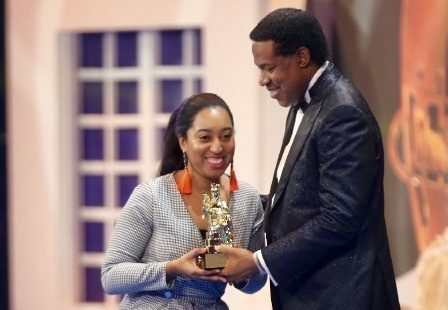 Carissa Sharon Oyakhilome is still basking in the glow of her double win from the recent Loveworld International Music Awards of 2018 (LIMA). The annual event honors the many talents that make up the Loveworld Music Ministry (LMAM), a collection of artists formed and fostered by the Christ Embassy president, Pastor Chris Oyakhilome. The Nigerian songbird’s famous single “Holy Spirit” earned her two LIMA awards in the categories, ‘Song of the Year’ and ‘Worship Song of the Year’. The win was indeed a huge feat as CSO had some tough competition in the running with artists such as Jeannine Zoe Wojacek, Frank Edwards, Kelly Lyon, Pastor Ester Miracle, T-Sharp, Eben and many, many more. According to the gospel music blog, Good Gospel Playlist, CSO had been “dreaming of writing a song that would inspire and motivate the masses to ascend to higher levels of devotion.” Following the big win, the gospel starlet took to social media to express her immense gratitude and the joy she experienced from achieving her dream of writing a hit worship song. Here is her incredibly heartfelt post. She went on to express how much she owes her success to God and how overwhelmed she felt about the prestigious prize. The song had a major impact on millions of listeners around the world. Despite tough competition this year, she managed to bag both awards. The song has since become a staple of the church gospel scene, as well as a top hit on the radio. The double win seriously overwhelmed the artist. Upon receiving it she thanked God and her talented team for guiding her and helping her through the process. Sharon shot the video in the beautiful country of Switzerland. The video that was produced by YOU Church features two incredibly talented kids who, through a beautifully choreographed dance interpret the ‘Holy Spirit’. The singer herself of course also stars in the video and looks stunning. CSO has not only been winning the hearts of her fans on the music front, but also won the heart of the exceedingly handsome and successful arts entrepreneur, Phillip Frimpong. The two got engaged over a year ago and by October 2018 tied the knot. The gospel vocalist is completely head over hills with her Ghanaian businessman and was ecstatic over his surprise proposal. In a declaration of love and excitement, CSO wrote on Instagram, “YES! I am engaged to my very best friend! The most amazing and my absolute favorite person…I am so, so blessed I would say yes over and over I love you.” Wow, What a lucky woman. The beautiful wedding brought the traditions of Nigeria and Ghana together to create a wonderfully bright and colorful celebration of love. For the official union, Sharon transformed into a beautiful white off-the-shoulder ball gown and was walked down the aisle by the father and founder of Loveworld Incorporated, Pastor Chris Oyakhilome. It’s fair to say that things are going swimmingly for Nigeria’s favorite singer. According to Good Gospel Playlist, the daughter of the president of Christ Embassy, is gearing up for some new songs and several other church-related philanthropic projects that will certainly delight her fans.